If you are coming from Cecilia at My Thrift Store Addiction, welcome! If you have not visited Cecilia's tour for how she is transitioning from summer to fall, be sure you visit her to see how she takes her thrift store finds and makes them special for her house. After her inspiration, you may just be heading to your closest thrift store to transition your home into fall. so others will know about this special tour of homes. 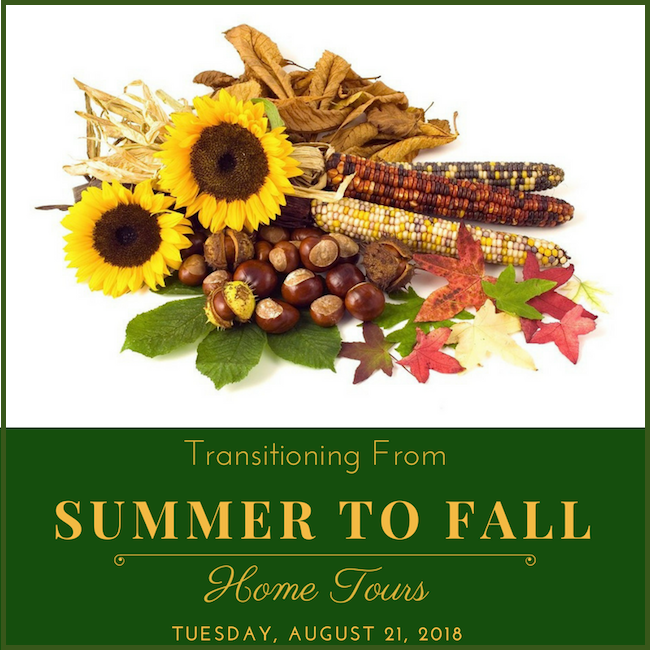 Thanks to Amber Lyon Ferguson at Follow The Yellow Brick Home for inviting me to be part of a blog hop with twenty other bloggers sharing how we transition our homes from summer to just before fall. There are links to everyone participating at the end of the post. Be sure to check out all of them because there are so many great ideas of how to give your home a little transitioning-to-fall love now. Please PIN ⥣ to your Fall Pinterest board. 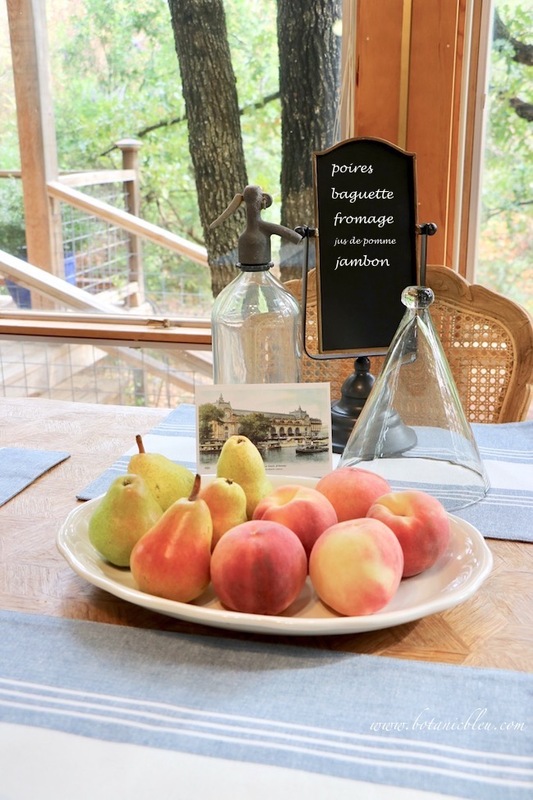 Come on in to see a few ideas of how I introduce fall gently into my French Country kitchen. Summer lasts a long time in Texas. Some say we have only two seasons. Summer and winter, where winter lasts about three weeks max. Then it is back to summer. No fall; no spring; just winter, summer, summer, summer. Yet, when the school bells ring once again in August each year, my mind thinks it is Fall even though the temperatures say it is still summer. The seasons of the year are founded in life-long traditions, not temperatures. And my nesting instincts begin to make changes to shift from high summer of unstructured schedules and impromptu ice cream runs to the days of bell schedules and routine tasks. Typically those changes begin in my kitchen, the heart of my home. White is prominent in my kitchen year round with the white cabinets, appliances, and dishes, but blue is also a main color. 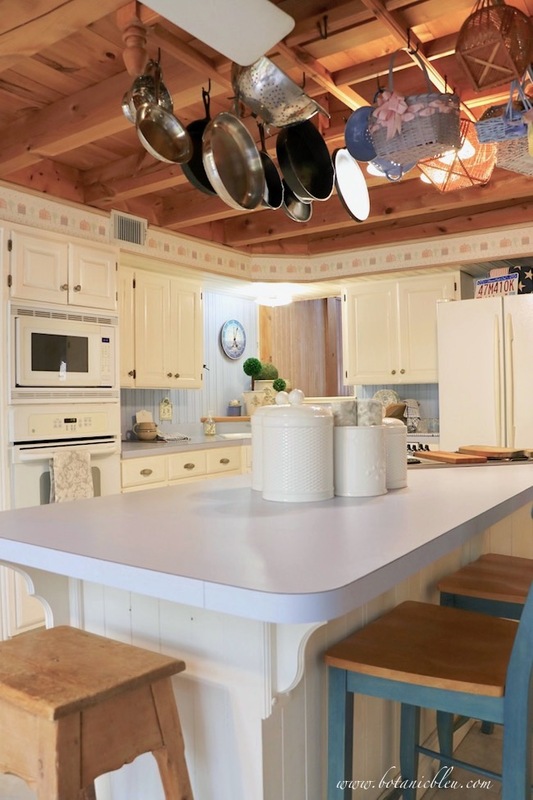 The countertops and bead board walls are light periwinkle blue. The counter stools are medium blue. Most sets of dishes have blue designs, and most of the kitchen dish towels have blue patterns. 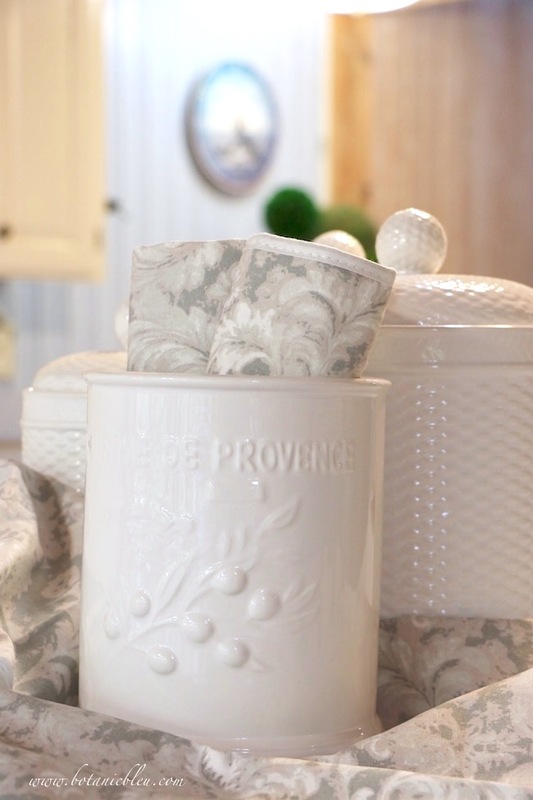 Multi-gray French style floral dish towels and pot holders now take the place of the usual blue towels and pot holders. The pale gray neutral color is a subtle nod to the coming fall colors after foliage loses its brilliant reds, oranges, and yellows. Muted browns and grays will emerge when plants lose all their color. Gray goes beautifully with my blues, but if gray does not go with your colors, you can introduce fall tones by using pale beige or brown instead of gray. White goes with everything. Whatever your kitchen's color you can add white. 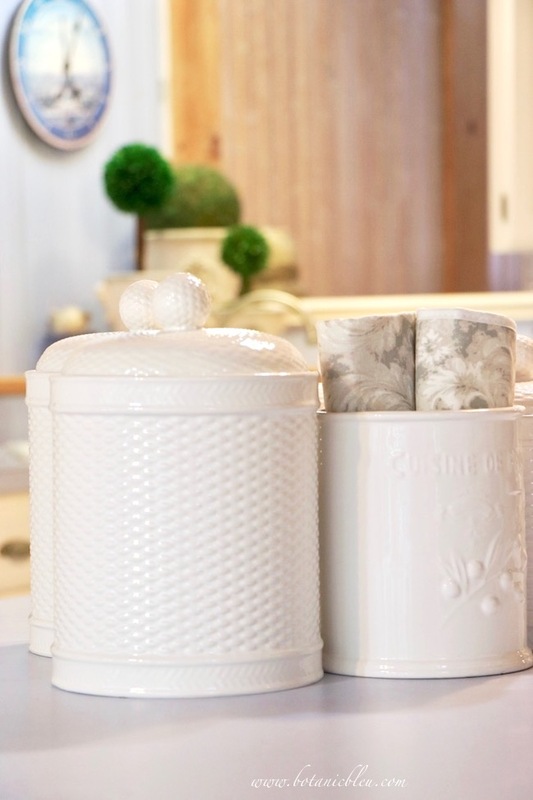 More white has been added to my kitchen with new French Country style canisters in a white basketweave pattern. Basketweave says country to me whether it is farmhouse, rustic cabin, American Country, traditional, or French Country. Whatever style country you love, basketweave fits right in with it. 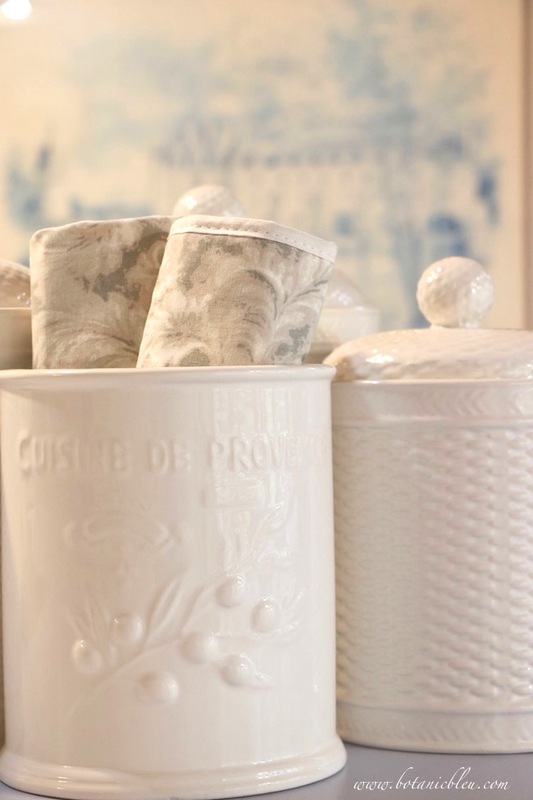 The open white canister has a raised quote, "Cuisine de Provence." Tone-on-tone raised patterns add nuanced design to blend with other items instead of drawing attention to themselves. Which is a kind of neutral form of decorating. If you want to add a quote to your home during an early fall transition, try using tone-on-tone. There's nothing better than juicy white peaches on a hot summer day. Peach cobbler with homemade vanilla ice cream is near the top of the list of peach recipes for me. But, even higher on the list is a bowl of sliced white peaches sprinkled with just enough sugar to make the peaches juicy. Yellow peaches are yummy, too. I love to eat them with black-eyed peas and cornbread. Peaches, black-eyed peas, and cornbread are on the menu every summer, and it is not high summer until that meal occurs. 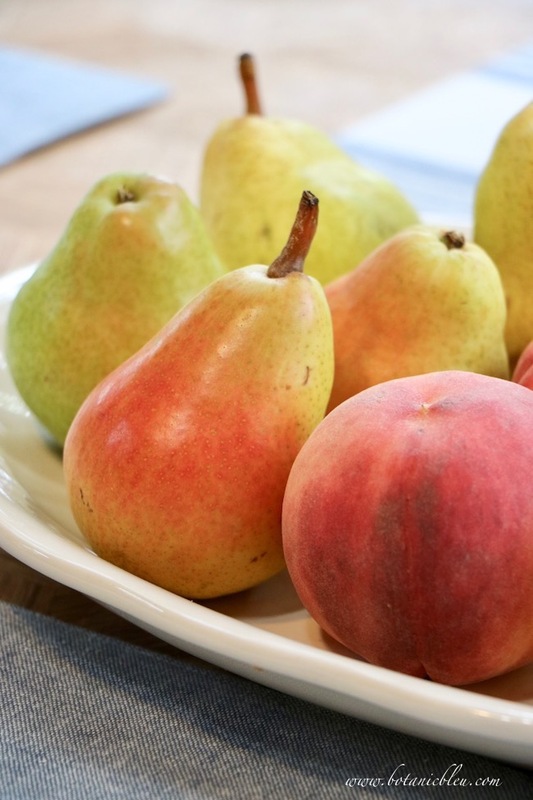 When pears arrive at the farmer's market, and peaches are no longer available, it is time for fall. This week we have both peaches and pears on the breakfast table in the kitchen. A time of fruit transition, and summer easing into fall. Do you set your fruit out as part of your home's decorating? Darker colors, black, charcoal, and dark blue, are another way to transition from summer to fall decorating. Does the first day of school each year make you think Fall? And is there any more iconic object that says School more than a blackboard? School is where we saw our first blackboards and are now forever linked in my mind with school and fall. 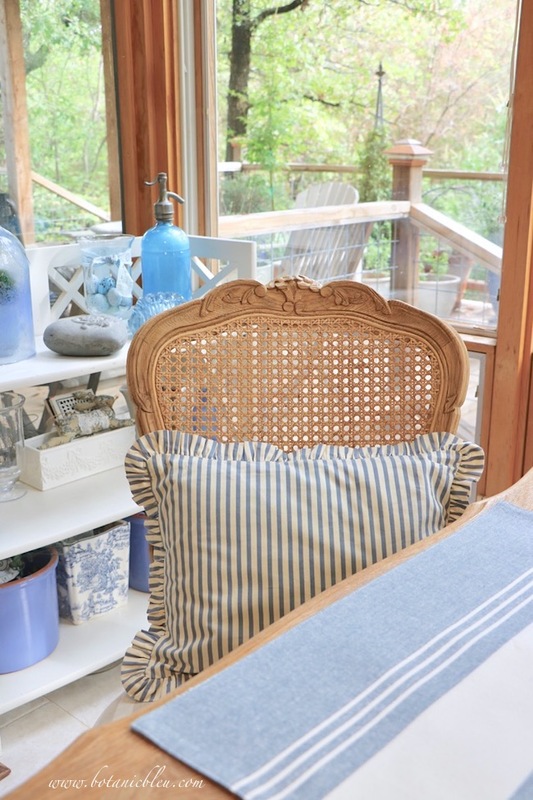 A little collection of French-style items sit on my breakfast table. The vintage clear seltzer bottle is from France and has the word "Paris" engraved on its gray metal nozzle. 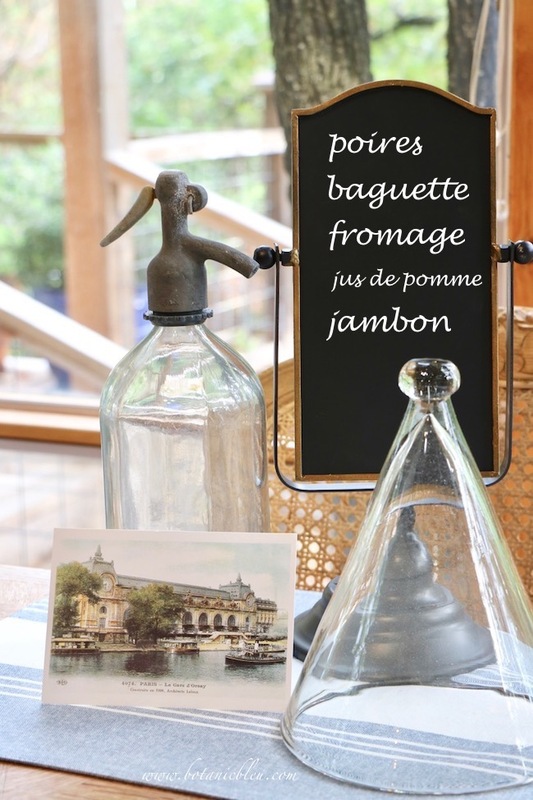 The vertical blackboard is like the ones used in patisseries (bakeries) and bistros (small cafés) throughout France. The vertical blackboard displays a grocery list for a small late summer, just-before-fall picnic. Poires (pears), baguette (loaf of French bread), fromage (cheese), jus de pomme (apple juice), and jambon (ham). French Country may not be your style, but you can add a little late, late summer / early, early fall decorating with a collection of your favorite dark gray and black items. A postcard of La Gare d'Orsay as it looked in 1900 when it was still a train station picks up the dark colors in the blackboard and seltzer bottle and blends with the blues in my kitchen. When traveling, look for picturesque postcards to use in your home decorations. If you love a location, a postcard is an inexpensive way to remember your good times there. I watch for Christmas scenes in postcards to use for the holidays. New dark blue and white striped placemats replaced a set of muted pale green and white striped round placemats. The darker color of the blue in the placemats and the darker blue and off-white striped pillow are good choices for transitional fall decorating. Try using deeper tones in your home's colors to achieve similar results. The dark tones will still go with your colors, but give a fall look. Just like that, easing a little fall decor into my French Country kitchen with ideas and colors you can use to give a little fall to your home also. Does Fall arrive with a bang at your house or does Fall gently ease into your house? 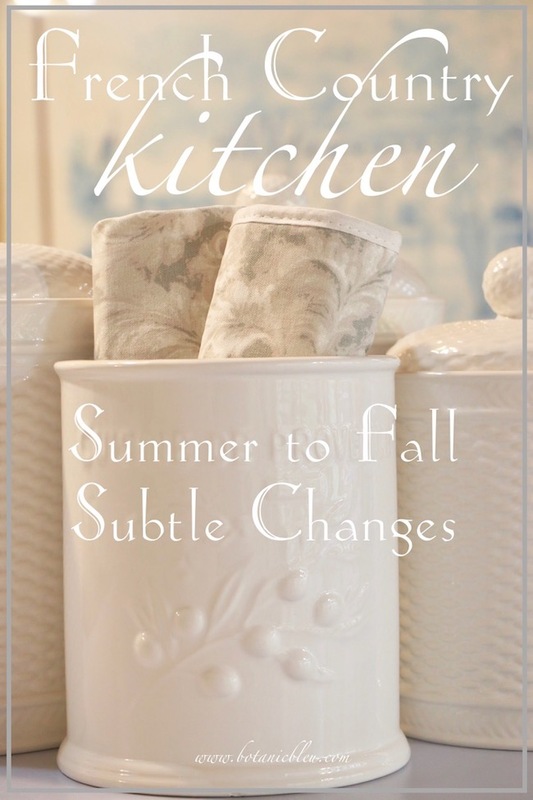 In case you would like to know where to find some of the things I am using to transition my kitchen from summer to fall, you can find them at the sources below. Thank you for taking the tour of my French Country kitchen summer-to-fall tour. You can find an entire collection of more ideas from the amazing bloggers below who are also sharing a tour of how they transition their homes from summer to fall. So many talented ideas and beauty gathered in one spot! Thank you, Amber Lyon Ferguson at Follow the Yellow Brick Home, for gathering all of us together. Next up on the tour is super talented Angelina who blogs at Petite Haus. You KNOW I love everything she shares because we share a love for FRANCE! Her new French Country home is a dream come true, and she uses authentic French design which makes my eyes dance. If you did not know she lived in California, you would think you are peeking into a house in France. I am absolutely enchanted with the idea of a French flavored fall. I will definitely be incorporating some of these wonderful touches. How lovely, Judith! I am a fan of gray and white...and the warmth of the wood. I would love to share a meal at this table! I love, love, love your kitchen, so pretty and that ceiling always makes me drool. Such a lovely way to usher in a touch of Fall with just a few accessories. Beautiful tour. As a blogger, fall comes in small doses. Before that though, I'd spend a day getting it all out of the attic and boom, the next day it was all kinds of crazy fall. I think as I've gotten older, I like simplifying. Your home is so welcoming. Love it! Living in Florida, fall also arrives quite slowly at my house. I really enjoyed touring your home and would love to have you come and share this or other posts at my Celebrate Your Story link party! Sometimes there is just too much American Farmhouse style, and you have done such a lovely job with your Country French decor! I love all of the white with the subtle blues in your kitchen. Being a coastal decor person, anything in blue always catches my eye! Judith, I love your french country style! Your kitchen is gorgeous! It has been so much fun touring with you! Enjoy your week!!! Basketweave also reminds me of country style - all types. Next to cherries, peaches are my favorite fruit... I think I just like stone fruits! Yes, a peach cobbler and vanilla ice cream, that says Summer to me too, but I do like pears as well. I think I must be hungry. Anyway, love your transitional decor! oh and also thank you for the wonderful introduction! Judith, what a beautiful kitchen. I love the subtle touches of fall. Displaying fruit certainly screams fall to me. I found a cute black crate today at a thrift that says something about fresh fruit. I hurried home, washed it; and filled it with peaches from a local stand just down the street from our home. Love the combination of blue, white, and grey. So fun to see your pretty home, Judith! Love your soft colors and style! I love the soft neutral colors that will be even more beautiful when the Fall colors are seen from your windows! 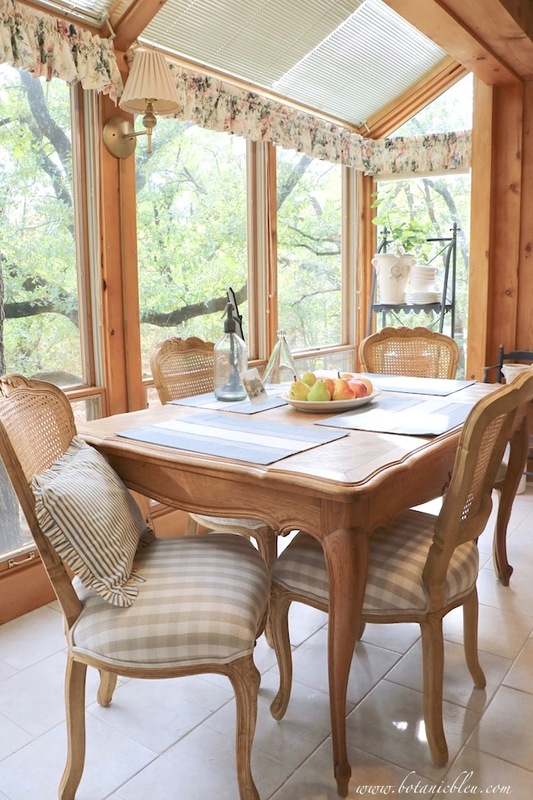 I love all your French accents in you kitchen and dining area. I also love your tree top view! Gorgeous! Judith I just love your home and love that we have connected through this tour! The blues in your kitchen speak my love language as do the FRENCH touches! Happy almost Fall! From peaches to pears. That is one way fall actually does appear in our neck of the woods! Judith, I love the tonal changes you've made and/or suggest for transitioning the seasons. My bath is much like your kitchen tones, and it's very soothing. The association of the seasonal fruits is key for me as well in marking the seasons, as are the florals and textiles. Judith, your kitchen is gorgeous! I just love those exposed beams! And I love your gorgeous table vignette - I'll take that seltzer bottle off your hands if you ever get tired of it ;) So happy to be on the home tours with you! I absolutely love your french country kitchen! All the little details are so beautiful. So glad to join you on this tour. What a lovely French Country tour of your stunning kitchen. I am totally smitten with your table and chairs to enjoy the outdoors! Judith what a delightful tour! 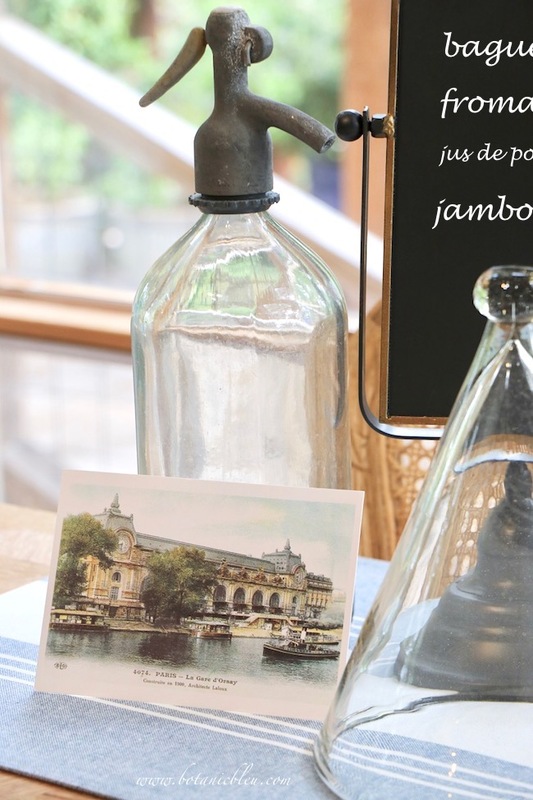 As a fellow Francophile, this post makes my heart flutter! I love all of your subtle nods to early fall. I love how you have used peaches and pears for August, yum! I cannot eat any refined sugar for health reasons, and can only eat minimal fruits, but pears and peaches are definitely favorite treats for me! You are so right that life-long traditions and not temperatures dictate seasonal changes in our homes and routines. Like you, back-to-school means fall has arrived even though it is still summer in some parts of the country when school starts back. Most of us remember the days of starting school close to or after Labor Day, so it was much closer to fall. I also agree that chalkboards are great for fall since they are synonymous with school starting. I used one in my entry to greet my music students as they started back lessons this week. Your home is so lovely and it was a joy to have your join us mon ami! I am looking forward to all you share as fall continues. Enjoy the rest of summer and fall ahead! I am in love with your home!!! It is lovely, welcoming and bright. Your French Country kitchen is a dream. I would love to share a meal at this table! Beautiful. Thanks for linking to Keep in Touch.